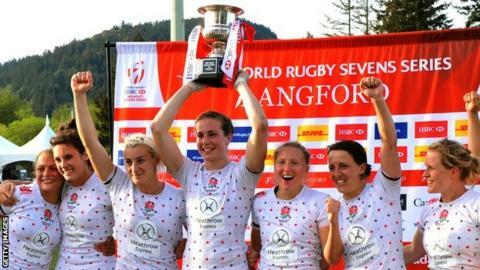 England women won the season's penultimate World Rugby Sevens Series tournament in Canada. A dominant second-half performance saw them defeat champions New Zealand 31-14, having trailed 14-7. Australia, beaten by England in the semi-finals, had won all three of the season's previous tournaments. "We really are building," said England captain Emily Scarratt. "We've gone away and worked really hard and that was the product of it." The 2015-16 World Rugby Women's Sevens Series consists of five tournaments held at different locations around the world. At the end of the season, the overall champion is decided based on points accumulated. Winning a tournament earns a team 20 points, coming second 18, while the team that finishes last wins just one point. She added: "We knew it would be a tough game but that if we played to our style we could win. We're tired but we are very happy." Ireland finished 11th by beating Japan 12-5 but remain bottom of the 12-team standings. New Zealand are second with 64 points, 12 behind Australia, but are unlikely to catch the leaders. Should New Zealand win the next tournament, Australia would have to finish eighth or lower for them to top the rankings. The final tournament of the season takes place in the French city of Clermont-Ferrand on 28-29 May.